Grace Ev. 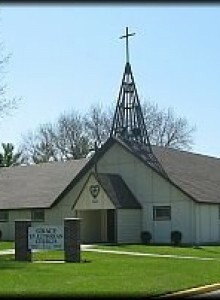 Lutheran Church has as its first priority the preaching and teaching of Jesus Christ as the only Savior of all mankind. We believe that the Bible is God’s holy Word, given for the purpose of bringing men, women and children to know Jesus Christ as their Savior. The Bible says, But sanctify the Lord God in your hearts, and always be ready to give a defense to everyone who asks you a reason for the hope that is in you, with meekness and fear (1 Peter 3:15). For this reason we gather to worship and grow in our faith and understanding of our Savior, that we may be good and faithful witnesses of Him in the world. We strive, by the grace of God, to maintain the truth of God’s Word, and we believe that God has graciously preserved His truth in our midst. We invite you to share it with us. As a confessional Lutheran Church we proclaim the true Scripture doctrine and uphold the Lutheran confessions which our Lord restored through Martin Luther 500 years ago. We are affiliated with other like-minded churches known as the the Church of the Lutheran Confession (CLC).